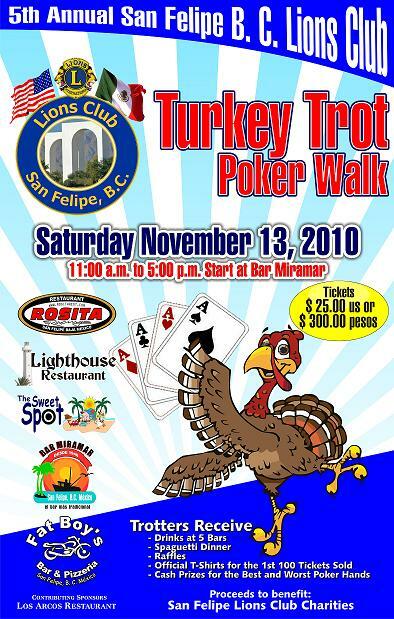 BAJA NEWS: Since 2007: SAN FELIPE - 5th annual “Turkey Trot” SUCCESS! SAN FELIPE - 5th annual “Turkey Trot” SUCCESS! On a sun drenched Saturday in beautiful downtown San Felipe the community came out to have some fun. 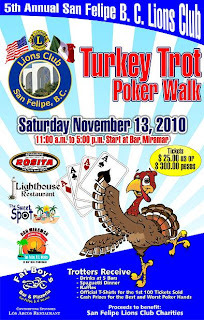 The 5th annual “Turkey Trot” poker walk was hosted by the San Felipe B.C. Lions Club as a traditional fundraiser for Lions charities. Participants gathered at the legendary” Bar Mira Mar” on the Malecon for registration, drink tickets and the first card of their poker hands. The local restaurants and bars were busy mixing Margaritas and pouring beers as the “Trotters” made their way from one establishment to another to receive, yet another card to complete their poker hands. This routine was followed as they traveled to the “Sweet Spot”, The “Lighthouse”, “Rositas”, “Fat Boys” and then returned to “Bar Mira Mar” for a Spaghetti dinner and awards presentation. A drawing was held for the awarding of five (5) Thanksgiving turkeys and cash prizes were given for the three (3) best poker hands and one for the worst hand. Several local merchants donated a variety of prizes that were also raffled off. The San Felipe B.C. Lions Club would like to thank the entire community for supporting this fun event and a special thank you to all you “Trotters”. See you again, this time next year, for another fun event. Happy Thanksgiving to all.